Germany’s Kuehne + Nagel is the returning newcomer in the top 3 of this year’s Top 100 logistics service providers 2017. DHL has once again topped the list as the undisputed leader, with DB Schenker following close behind. American XPO logistics has fallen out of the top 3 and now occupies 4th place. 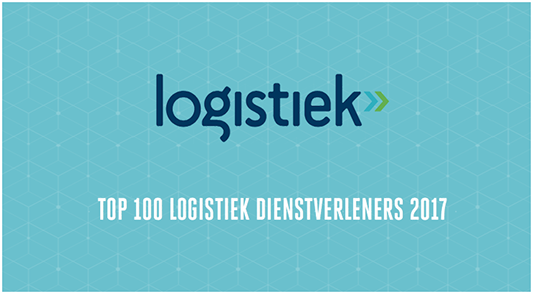 Once yearly, Dutch online logistics magazine logistiek.nl teams with Buck Consultants International to create a list of the ‘Top 100 Logistics Service Providers’. The list offers a complete overview of the most important parties within the Dutch logistics contract market, ranked in order by the number of permanent logistics employees in the Netherlands. Who is in the top 10? In the Netherlands, the leading three logistics service providers in the areas of contract logistics, groupage shipments, and distribution are all firms belonging to a German parent company – DHL, DB Schenker, and Kuehne + Nagel. The only newcomer to the top 10 this year is Arvato – another German company that has benefited from the increased interest from the US and Asia in the distribution of high-tech products in the Netherlands. Arvato opened a new distribution centre in Limburg in 2016, and this increase in permanent employment has helped to land Arvato a place in the top ten. Arvato has knocked Bakker Logistics out of the top 10. It is interesting to note that the top 10 now consists entirely of subsidiaries belonging to foreign parent companies from Germany (x5), the United States (3x), Denmark, and New Zealand; whereas – remarkably – places 11 through 18 are held by Dutch organisations. According to the logistiek.nl, there are unusually few notable shifts in the Top 100 list for 2017. This is partially due to the fact there were fewer major acquisitions and business closures in 2016 than in the years prior, says Kees Verweij, a partner at Buck Consultants International who is closely involved with the annual research. To see the complete Top 100 logistics service providers 2017 by logistiek.nl, click here.